We understand that you want the best security for your property - whether you are working in healthcare, education, retail, transportation, commercial or multi-residential. Simply put, your building must be well protected against risks such as burglary or vandalism. Changes in Building Regulations are increasing the demands on the products used to gain access to a building. ASSA ABLOY have developed a family of security enhanced automatic entrances to meet these requirements. Up, up and away – GEZE UK has helped a stunning new airport hotel prepare for ‘take off’ with a range of products that have given it a real ‘wow factor’. Boon Edam Limited discusses how today's climate has led to the emerging trend of security through forms of turnstile for Universities and higher educational buildings. Increasing security standards promotes the development of leading security enhanced automatic entrances. The magnificent marble entrance hall at the award winning Gainsborough Bath Spa Hotel has been created by National Federation of Terrazzo, Marble and Mosaic Specialists (NFTMMS) member Zanetti & Company Ltd.
All-glass revolving doors were brought to the market by global entry experts Boon Edam in 1996. Designed with an ‘always open, always closed’ principle in mind, Boon Edam’s iconic revolving doors are open for visitors to pass through with ease, while remaining closed to dirt, noise, and adverse weather conditions. In 1715 the eminent British Author, Daniel Defoe, said: “Liverpool(e) is one of the wonders of Britain. What it may grow to in time I know not.” It is in this spirit that The Royal Institute of British Architects (RIBA) will open a new national architecture centre, RIBA North, on 17th June on the Liverpool Waterfront, designed by Matt Brook of Broadway Malyan – who also designed Mann Island. 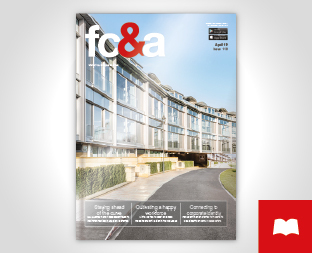 Here, FC&A looks at RIBA’s latest centre. A Vasco aluminium radiator not only has architectural design but high level efficiency, low level running costs and extremely swift heat production. Aluminium is a super-efficient heat conductor which means that an aluminium radiator can be surprisingly compact, use only two litres of water, but have an incredibly impressive heat output leading to significant energy savings. Looking to control the temperature of your lobby? With a boon edam heater it's a breeze! During periods of cold and windy weather, why allow the temperature in your lobby to drop? Just because it is chilly outside, doesn’t mean your reception area should be cold too.